Thanks to B-Secur director Colin & team members Alan. Annie, & Alan of this fab local company for introducing Mike Nesbitt MLA and myself this week to their pioneering and innovative tech using heartbeat to battle stress and promote wellbeing. Big thanks also to New York State Comptroller Tom DiNapoli whose special fund to bolster the peace fund has invested in B-Secur. With 47 days to go, you can bet your bottom dollar that we are most certainly braced for Brexit. It’s a time of great peril for our peace process, for our economy and for our culture and identity as proud Irish and European citizens. But it’s also a a time to keep things simple. Despite the daily round of embarrassing U-turns and political somersaults from Westminster, the majority in the North of Ireland who voted to Remain are focused on the North Star of the Backstop. There can be no good Brexit, but the backstop will protect the peace, support the economy and defend the rights grounded in the Good Friday Agreement. Thankfully, the EU 27 and the Irish Government have been resolute in their defence of the backstop – long may that continue. As for those from these parts who persist in their claims that a No Deal crash-out is better than the deal on the table, I think Angela McGowan, CEO of the CBI in the North, had the best response when she dubbed a Brexiteer leap into the abyss as “an affront to rational thinking”. In times of turbulence, it’s crucial, of course, to keep an eye on the big picture but it’s also a good time to build local. In that respect, I was delighted this week to visit the offices in the Catalyst Inc science park of B-Secur, a revolutionary company using our unique heartbeat to prevent traffic accidents by alerting drivers to their stress levels. Already 36-people strong and enjoying investment from that great honorary Irish American Tom DiNapoli, Comptroller of New York State, B-Secur is well-placed for meteoric growth. Who knows it might just realise CEO Alan Foreman’s dream of becoming Belfast’s first billion-dollar company. 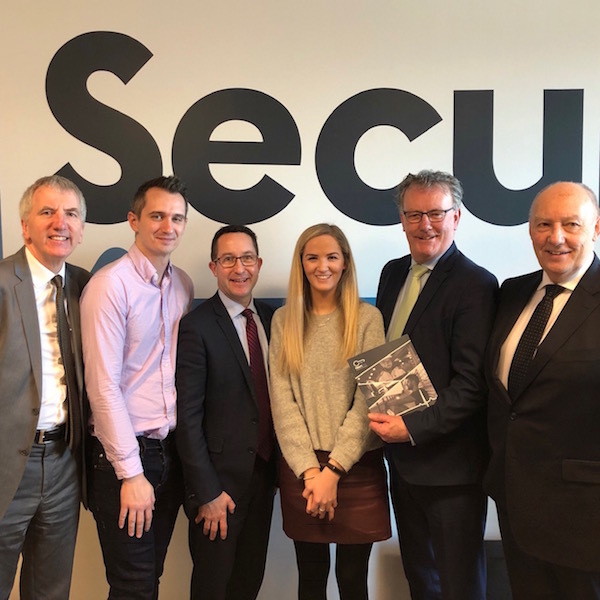 Kudos to B-Secur Director Colin Anderson for inviting myself and Ulster Unionist MLA Mike Nesbitt along to meet this standout enterprise. 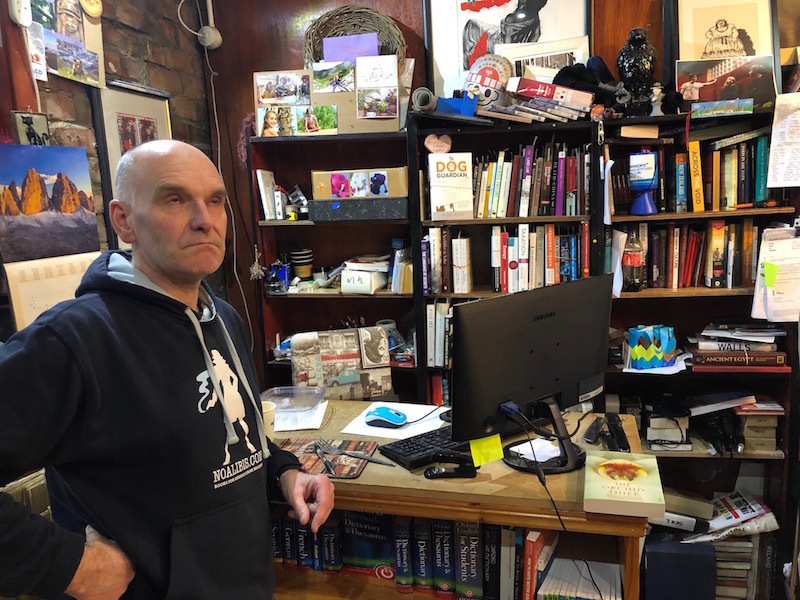 Dave Torrans, founder of NoAlibis, is proud of his bibliomaniacs’ paradise but how come an independent bookstore in Belfast pays the same rates as Starbucks? It’s fair to say that unlike B-Secur, the NoAlibis bookstore in South Belfast hasn’t yet raised £10m from investors but it truly is a treasure of the resurgent city. A bookshop is so much more than just another retail operation — though, sadly, it is subject to the exact same business rates as a multinational such as Starbucks which occupies a unit on the other side of Botanic Avenue. A bookstore is a meeting place, a republic of letters, a temple of learning, and a font of great literature. No Alibis ticks all those boxes and more and for a while now I’ve been contacting the shop via its Twitter feed and ordering books in rather than clicking on the Amazon tab. After all, NoAlibis pays exactly £13,000 more in property taxes per annum than that awesome leviathan, Amazon — which, you’ve guessed it, pays zero in business rates in our city. No wonder owner Dave Torrans is looking reflective in this snap I took yesterday. Hats off to another local business The Ireton by Stay in Belfast where manageress Laura McCormick (see video below) is rolling out the red carpet for guests from far and near. I am often asked on my travels in the US, what Irish Americans can do to help. Well, one thing all our friends can do is visit. 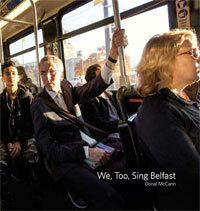 And I’m convinced those who come once will leave as ambassadors for Belfast and return again, and again. Not that we’re short of ambassadors, fortunately. Indeed, and to leave where we came in, our hearts soared this week when we saw members of the US House of Representatives from both sides of the aisle insist Brexit not be allowed to result in a return of a hard border in Ireland. Thankfully, our great allies on Capitol Hill, led by Chair of the House Ways and Means Committee, Congressman Richard Neal, are big fans of rational thinking.